Let’s take a look at the South Sea pearl value. These pearls are known for their size and color quality. Produced by specific oyster beds unlike any other in the world, South Sea pearls take much longer to form than other cultured options. With a 2-4-year development cycle, South Sea pearls develop a large amount of nacre making them larger and more lustrous than other pearls. Of course, the size and luster make them more expensive as well. Determining a South Sea pearl value can be confusing at first. But once it is understood what produces a pearl and why some are very rare, the process becomes easier to explain. White South Sea Pearls are almost exclusively cultivated off the coast of Australia. Efforts to relocate or start new beds have not been successful. This means there is a limited amount of production for the South Sea pearl which cannot be expanded. The pearls are valued for their great size. But, the same long development cycle which produces larger pearls also leaves more time for imperfections to occur. For this reason, the number of well-shaped South Sea pearls harvested is low, making them even more sought after. Due to their size and scarcity, the South Sea pearl value is quite high compared to similarly cultivated pearls from other parts of the world. 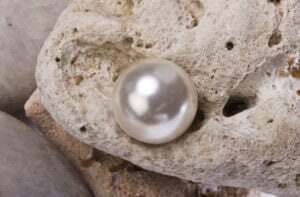 Pearl luster describes the level of reflection and refraction of the pearl. A pearl with the highest luster will perfectly reflect your face when you peer into its surface. The refraction produces a warm and glowing effect. The larger South Sea pearls are especially known for this due to the amount of body their extra nacre provides. Spherical is the most valuable shape among pearls. All other pearl shapes are called baroque, and they take many forms. Only a small percentage of pearls are spherical, making this a prime determinant when deciding value. Size comes into play when the other grading areas are identical but does not usually hold the most weight when determining value. For pearl size to matter greatly, the pearl must be of the right shape and color with a high level of luster and surface quality. A pearl’s color is actually made up of two tones. The inner color and the outer overlaying hue. This gives the pearl its iconic depth and warmth. To be highly graded a pearl’s color must be uniform over the entire surface. Many flaws can mar the surface of a pearl. Although small imperfections can exist on a highly valuable pearl, most buyers are seeking a surface as near to perfection as possible. No pits, wrinkles, or cracks will be observed in a high dollar pearl. Using these guidelines, even things as complicated as the South Sea Pearl value can be easily established and used to compare against other pearls on the market. Armed with this knowledge, an informed buyer can determine the best pearl for the money, making shopping for the perfect pearl less painful.